This article describes several different layer-3 methods for deploying UAPs. Our recommended methods are found below under the Chrome Web Browser and Mobile App sections. On Amazon, create a virtual controller instance on EC2. Read this article on the subject. Configure/stage a few APs in our lab and customize the guest portals. When we're at the customer's site, open a browser to the cloud-based controller. Either configure the DHCP server, DNS server or simply use the UniFi Discovery Utility to make all local APs inform back to the controller. On-going management/monitoring can be done anywhere and Amazon would provide us with great firewall configurations. UniFi APs have a default inform URL http://unifi:8080/inform. Thus, the purpose of using DHCP option 43 or DNS is to allow the AP to know the IP of the Controller. After installing the Discovery tool plugin (freely available in Chrome Web Store) on a desktop PC running Chrome browser, locally-available, unmanaged UniFi Devices (i.e., same L2 network as your desktop PC) will appear "Pending Adoption" for L3 management via either of two cloud-ready UniFi interfaces: the SDN Dashboard and the Controller itself. 1. Go to https://unifi.ubnt.com/ and log in with your UBNT SSO credentials. 2. Go to the Devices section and locate the model with the Pending Adoption status. Click ADOPT. 3. 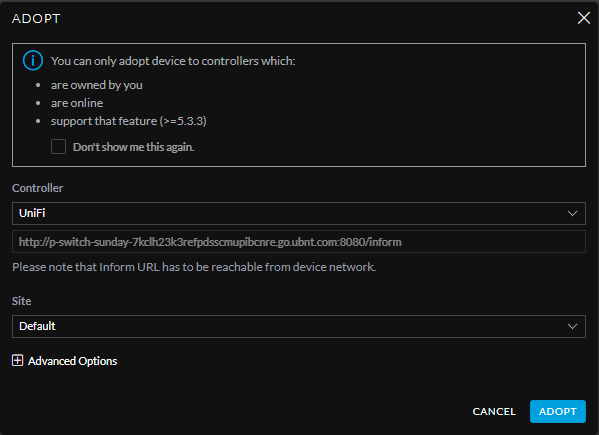 In the Adopt window that will appear, select the controller and the site that will be adopting the device and click Adopt. 1. Launch the UniFi Controller, go to the Devices section, find the device that is to be adopted with the status "Pending Adoption - Locally Discovered" and click Adopt under Actions. 1. After installing the UniFi Mobile App (freely available in iOS App Store & Android Play Store), launch the app, and tap Direct Access (in iOS, in Android you will see the Direct Access section on the screen once you launch the app, see images below). NOTE: Your mobile device must be connected to the same network as your devices, and must be able to access the controller directly (using HTTP). A public IP and/or port forwarding may be necessary. The inform port of the controller must be 8080. 2. Select your Controller from the list, or tap the "+" button to log in and add your controller. 3. For iOS: Once logged in to the Controller, tap More. Here there will be a Layer 3 Adoption option under Utilities. For Android: Tap the three-line "hamburger" menu and scroll down until you see L3 Adoption under Utilities. 3. Devices will be displayed on this screen. Tap on the device that is to be adopted and select Adopt. 4. After a few seconds (15-30 seconds, times will vary) the device will appear under the Devices section, which will be accessible by clicking on the Devices icon on the bottom menu bar. UniFi Discovery utility is installed along with the UniFi Controller. Run "java -jar <unifi_base>/lib/ace.jar discover"
If the AP is not in a default state. click "reset", specify the SSH username/password and click "Apply"
Click on "manage", modify the inform URL and leave the SSH username/password as ubnt/ubnt and click "Apply"
Open a browser to your remote UniFi Controller and you should see it is "Pending Approval"
Click on "adopt". You'll see it going to "Adopting" state, ignore it as it'll eventually become "Adoption Failed" or "Disconnected"
AP is now managed by the Controller. Once adopted, the Controller will upgrade these units automatically. The option of the Ubiquiti Discovery Tool Chrome Extension is also available, downloadable directly from Google Chrome here, or from our UBNT download page. NOTE: If your L3 Controller is available over the WAN then you need to make sure the necessary ports are open at the Controller side (minimum port 8080 for inform). If you do not have a static IP then you may want to consider using a dynamic DNS service, and use the domain name instead of the IP for the inform address. If you're using a USG then you can use the DDNS client that is available on that device itself. You'll need to configure your DNS server to resolve 'unifi' to your Controller's IP address. Make sure that AP can resolve Controller's domain name. For example, if you are setting http://XYZ:8080/inform, then ping from AP to determine if XYZ is resolvable/reachable. When configuring an AP from DHCP to static in the Controller UI, make sure you have put the IP of DNS. If not, then the AP cannot contact DNS to resolve Controller domain name. If using Ubiquiti's EdgeMAX routers, then DHCP option 43 can be done by just entering the IP address of the UniFi Controller in the "unifi" field on the DHCP-server. NOTE: The UniFi Security Gateway (USG) will not use DHCP option 43 to add the UniFi Controller location when obtaining a DHCP lease on the WAN interface. Cisco has a good write-up for DHCP option 43 setup. You can also use the IP of the Controller in the inform URL instead of the domain name. User Tip: Find more DHCP Option 43 instructions in the User Notes & Tips section. 1. Make sure the AP is running updated firmware. If it is not, see this guide: UniFi - Changing the Firmware of a UniFi Device. 4. After issuing the set-inform, the UniFi device will show up for adoption. Once you click adopt, the device will appear to go offline. 5. Once the device goes offline, issue the command set-inform in step 3 again. This will permanently save the inform address, and the device will start provisioning. 1. Issue the command set-inform in step 3 above. 2. The device will appear ready for adoption in the Controller. Click Adopt. 3. Wait for the 'Adopting' status to appear on the UniFi Controller, then issue the set-inform command again. 4. The device should now change to a 'Provisioning' status and then connect shortly thereafter. These notes have been added thanks to user collaboration. Have anything to contribute? Click on the Give Feedback button below! User Tip: For Windows Server please see this external blog post. NOTE: As in all our examples, we are using a sample IP address, you would input your own. 2. Click Convert to Hex! 4. Insert this in the Value field.